For our small and many-hatted team at The Jam Press, one of the delights of our job as writers and writing coaches is when we actually meet in person for intensive, inspiring planning sessions. Writing is mostly a solitary exercise, as is editing, crafting press releases, contacting vendors and reviewing ebook formatting. As I work mostly from home, getting a chance to break away from the solitary realm – as rewarding as it is in its own right – is an absolute thrill and I jump on it. For me, expanding my network by meeting other women who work for themselves is one of the most motivating things I can do in my work. 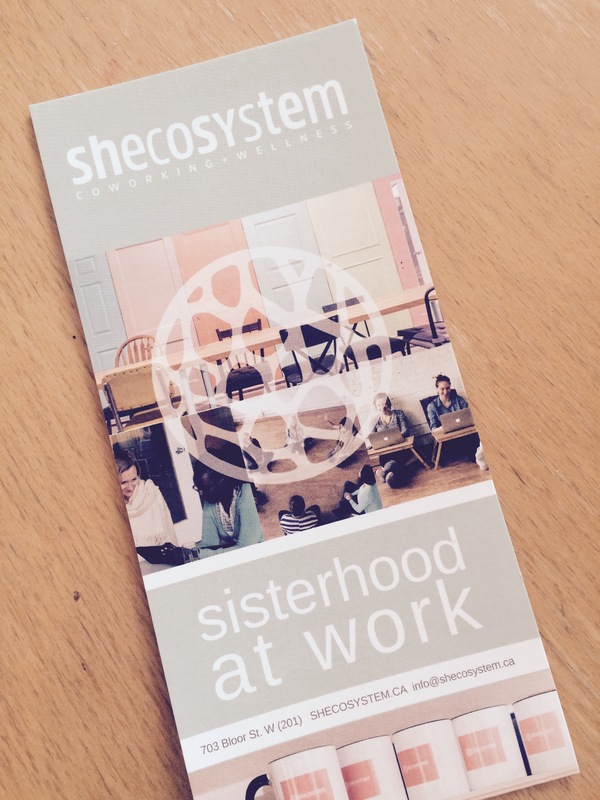 And so when my friend and fellow book editor Michelle MacAleese told me about Shecosystem, a friendly and productive coworking space at Bloor and Christie in Toronto, I was genuinely curious, and felt welcomed by a try-it-out-for-five-days package. A chance to make a cup of tea in the morning with other people? Let me in. The wonderful thing about showing up with the intention of getting stuff done is that other people might hold you accountable at the end of the day! It’s working in a community, not in a vacuum. It’s seeing someone else’s perspective on an issue, even if they aren’t particularly well-versed in the realities of your industry – they can still share valuable advice. It’s also experiencing that amazing talent most women have of knowing when to gab and when to focus. From the moment I took a mug off the shelf in the kitchen to the time I said goodbye to everyone later that day, it felt like we had worked alongside one another for months. The second time I worked at Shecosystem, all of us who were there by 10am got together in the middle of the big, bright floor and shared our priorities for the day. Just letting another professional know what I hoped to tackle was hugely empowering and somehow more tangible than reporting to family and friends what did happen that day. It reframed what I believed was possible, especially in the dead of winter with every self-employed person crawling back to their responsibilities after holiday hibernation and not quite working at full-tilt yet. The icing on the cake was discovering last week that the founder and operator of Sheco who welcomed me so warmly, Emily Rose Antflick, is an old friend of the person who originally introduced Jacqui and I. (Jacqui and I met through her niece, Julie Persofsky, the utter chance of which deserves its own blog post.) Emily has been incredibly successful in creating a space for women to feel that perfect balance of the comfort of home with the routine and communal vibes of the office. And it’s so non-officey. Emily’s offering of a place that provides workspace, community and wellness is so imperative to our understanding of how we can achieve productive and meaningful work. I kind of felt like I was visiting a friend at work, except that the arty and vibrant space was for me, too. Thank you, Emily! Looking forward to future days at Sheco.